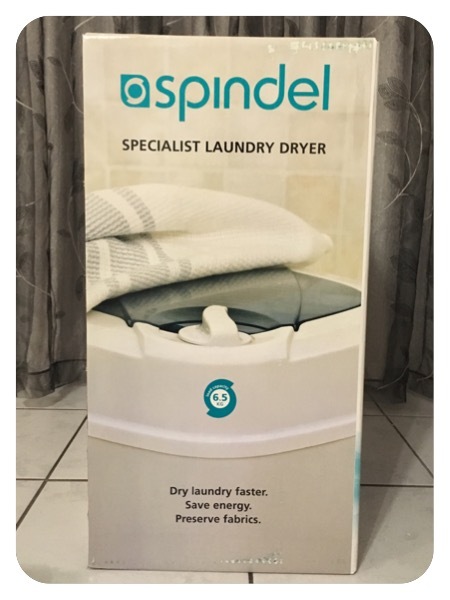 During winter 2013, when I still had difficulty coming to terms with such cold and rainy weather in Cape Town, I came across a Spindel laundry dryer. My first thought was WOW – finally an answer to my laundry woes. No heat, 3-minute cycles and the clothing comes out 80 percent dry. Where has this gem been hiding?! Fate had it that I would only become an owner of one a month ago when I won a competition on the Blessed Barrenness‘s blog. 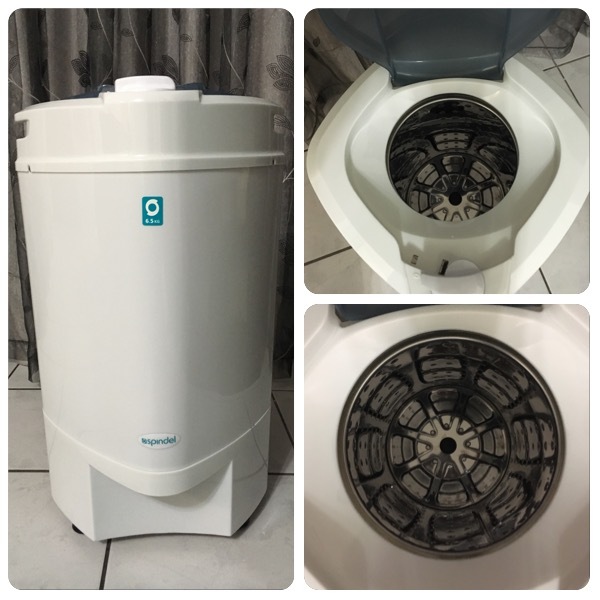 If you haven’t heard about Spindel yet, this is what you need to know: your laundry spins in a metal drum, without using any heat, and removes most of the water from your items. It’s almost dry in just 3 minutes! It’s a lifesaver if you live in a place where the winters are severe, if your washing line doesn’t get enough sun or would like to save on electricity by limiting the use of your tumble dryer. I’ve tried it out with my last load of washing – and it worked exactly as advertised. I put in some towels, long sleeved items and a few underwear. The towels were damp and the long sleeved items were partially damp, but both were much drier than after its spin in my washing machine alone. All it needed was a max. 2 hours hang in the sun to dry completely. On the other hand, the underwear items were almost completely dry. Because the Spindel doesn’t use heat, it’s safe to use on all your items. Follow the instructions on how to place the clothing inside the drum, as there should be a balance in the weight and item distribution inside in order for it to work effectively. I expected it to be louder when it’s switched on, but it was rather quiet with the noise being of little disturbance. 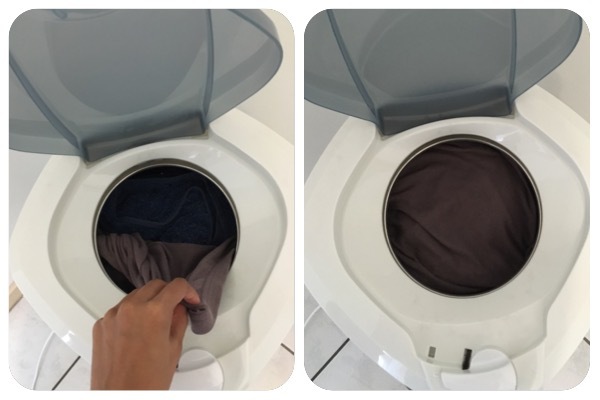 I was pleasantly surprised to see how much of water was extracted from the clothing, especially since I leave my clothing to spin for a small bit longer in my washing machine. The 6.5 kg Spindel isn’t very large and will be able to fit snugly into a corner. 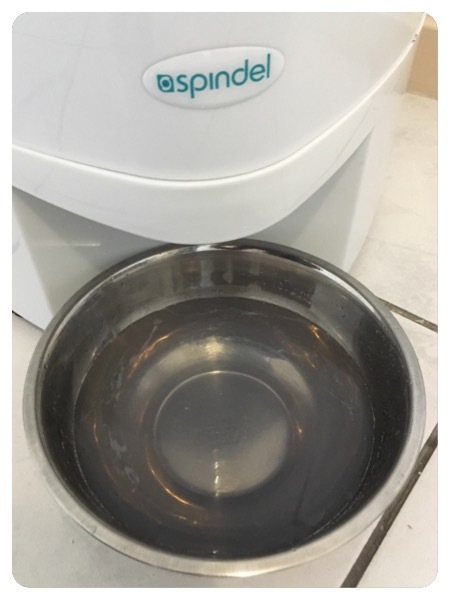 All you need is a plug nearby and a bowl for the extracted water to collect in. All things considered, I find it extremely useful when the weather isn’t on my side on laundry day. Are you thinking of getting a Spindel or bought one already? Share your thoughts – I’d love to know! actually looks like a mini washing machine, so cool. It does; it’s rather cute too. I love that it doesn’t take up much space for storage.